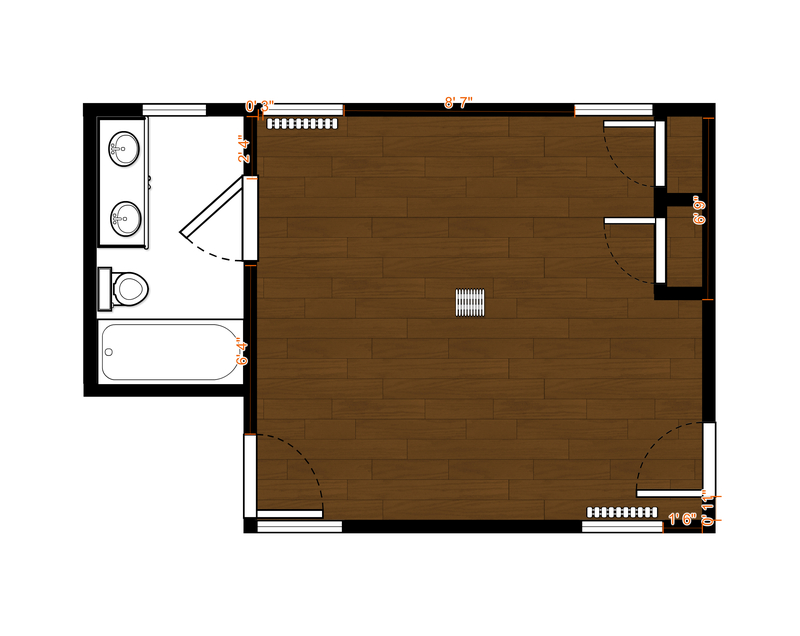 One of the first steps I take when determining the proper furniture placement is to create a detailed floor plan. So, after taking precise measurements of the entire space, I created a scale drawing of the room. 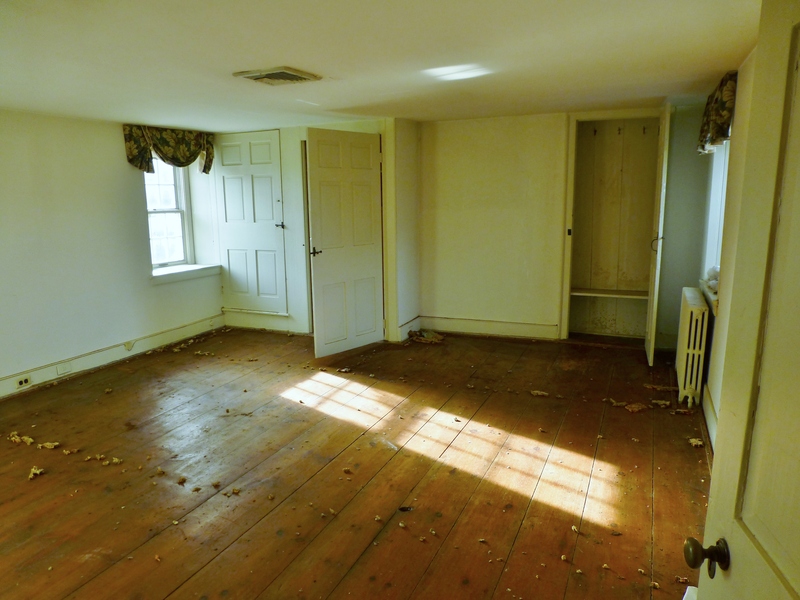 You may remember that the first thing you see upon entering the space is this wall of closet and attic doors. As you can see, the room is in quite a state! The wall opposite the entrance has an attic door (on the left), a cedar closet under the stair, then a small L-shaped nook of wall space and finally another shallow closet on the right. Usually when designing a bedroom, I like the bed to take center stage and be the first thing you see upon entering the space. 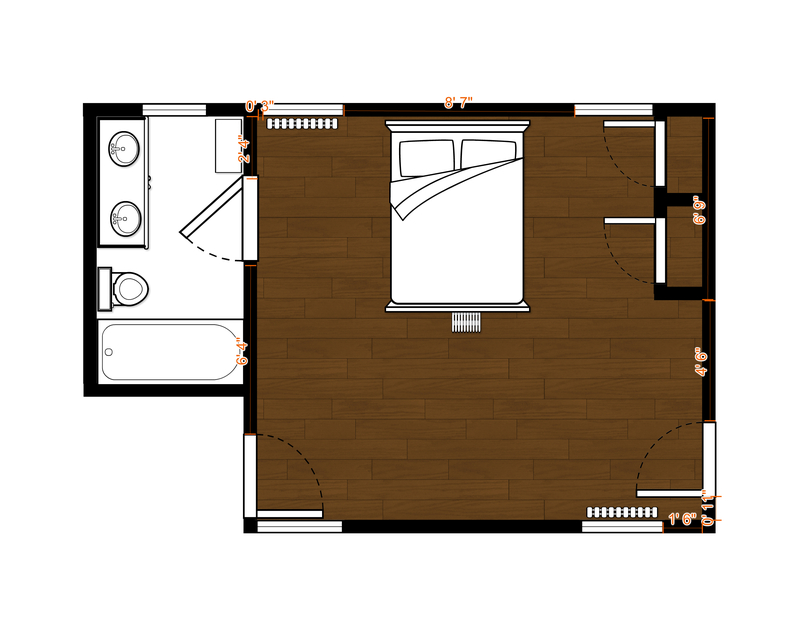 Obviously, the wall of doors means the bed absolutely cannot be placed on that focal wall. So the next logical space to place the bed is between the two windows on the left hand wall. If you rotate to the left, the long wall (approx. 18.5 feet) has two windows and a radiator. This is the most logical place for the bed’s placement. 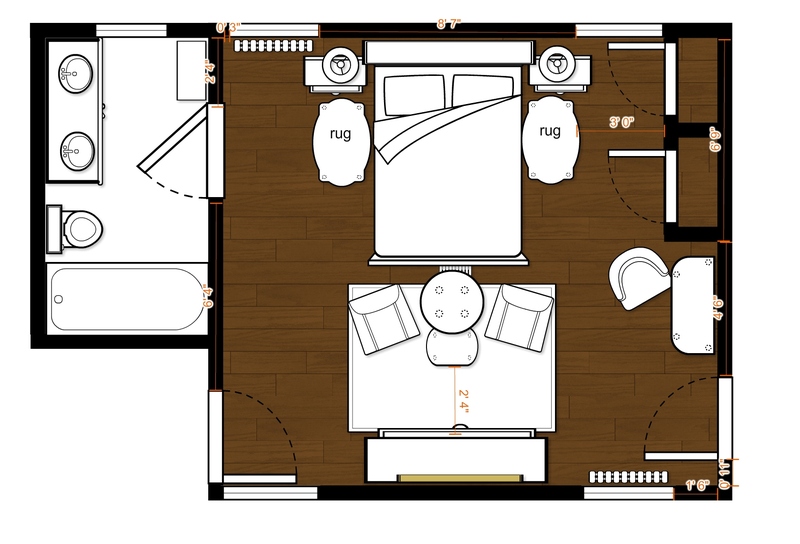 This is a scale drawing of the bedroom I’ll be designing for the 2016 Bucks County Designer House & Gardens. Next, I pondered what size bed I would use. Knowing that I wanted to design the space for a young lady, I toyed with whether using a pair of twin beds would work, or if a more grown-up Queen sized bed would be the better choice. While twin beds could have technically fit into the space, the awkward placement of the windows and radiator made it a tad close. In the end I chose to use a queen sized bed on the wall between the windows. A Queen-sized bed fits nicely on the wall between the windows. Next I began thinking of what to place at the foot of the bed and in the rest of the space. There is ample room at the foot of the bed for a bench or sitting area. The dresser could be placed either between the windows at the foot of the bed, or on the bathroom wall to the left of the entrance. After playing around I ended up with this floor plan. You can see that I added night stands on either side of the bed, and I thought a pair of small, plush rugs would make it nice to step out of bed in the morning. I also positioned a pair of chairs with a small table at the foot of the bed, placed on a pretty area rug. A nice big dresser is here too, placed between the windows opposite the bed. Finally, I put a small desk or vanity in the small L-shaped nook. It should provide a nice focal point across the room and would be very useful for the room’s occupant, as well. 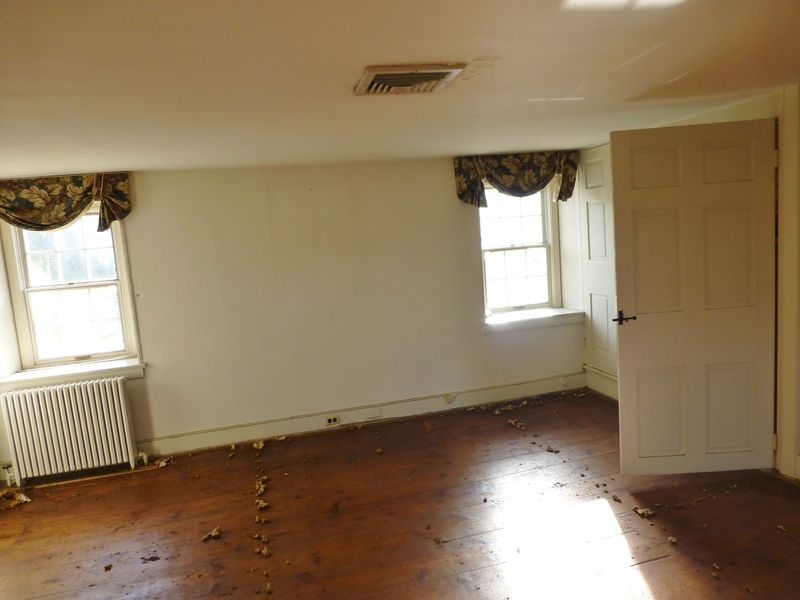 So, what do you think of the furniture placement in my 2016 Bucks County Designer House & Gardens bedroom? The next step will be to sketch out some pretty, inspirational drawings of the space and flesh out my ideas even further. I’m starting to think about the color scheme and, of course, that often means deciding which fabrics I’ll use. In addition, it’s time to start thinking about the window treatments, bedding, and the specific furniture pieces I’ll use. There’s still so much to do! I promise I’ll be sure to share a bit more with you soon. This entry was posted in 2016 Bucks County Designer House, Bedroom, Floor Plan, Interior Design & Decorating, Layout and tagged Bed, Bed Placement, Bucks County, Designer House, Furniture, Furniture Arrangement, Furniture Placement, Interior Design, Kristine Robinson, Queen Bed, Robinson interiors. Bookmark the permalink.